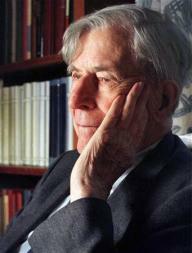 Jim Moore’s beautiful and warm observations of the passing of a giant of our times..
John Kenneth Galbraith was not only a beloved economist,he was also a local whose towering strides, slowing as he aged, were a common site on Church Street, Brattle Street, and in and around Harvard Square. There was something enormously calming about his presence, and something reassuring about seeing him striding through the square. apartment. My friend Sue Lowe Franklin lived with the Galbraiths for years. historians, and public servants were encouraged. He exemplified Eric Erickson’s “generative” person..using his magnificent talents to establish and extend fertile ground upon which others could plant and tend their own gardens and vinyards. Link: Jim Moore’s cybernetics, politics, emergence, etc. World unaware of Oil drying up.